Many applications can automatically arrange multiple windows for you (examples include Microsoft Word and PowerPoint). Choose Window → Arrange All (if this option appears). To see everything a window can show you, use the Zoom feature to expand any Finder or application window to its maximum practical size. (Zooming a Finder window is different from zooming with the Multi-Touch feature, because you’re expanding only the Finder window, not an image or document.) Note that a zoomed window can fill the entire screen, or (if that extra space isn’t applicable for the application) the window might expand to only a larger part of the Desktop. To zoom a window, move your pointer over the third button at the top-left corner of the window. A double-arrow icon appears on the Zoom/Full-Screen button. Click to expand your horizons to full-screen, or hold down the Option key while clicking to zoom the window to maximum size. Speaking of full-screen operation, it comes in very handy on a smaller laptop display — that’s where a single application fills the entire screen, without displaying a window frame or traditional Finder menu bar. The method you use to switch to full-screen mode varies depending on the application, so there’s no One Menu Command or One Keyboard Shortcut that will always do the deed. Most of the applications included with OS X El Capitan use View → Enter Full Screen, and many applications have a button you can click in the window to switch back and forth. 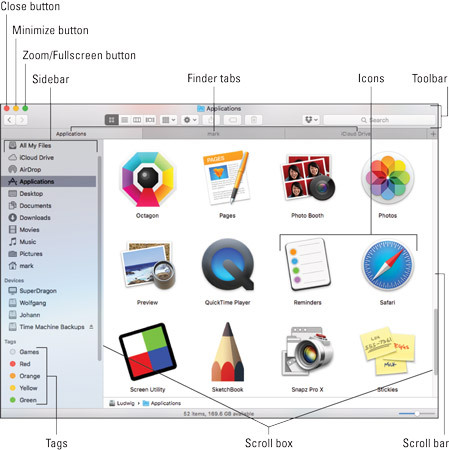 A click on the Zoom/Full-Screen button switches most Apple applications into full-screen. Finder windows can also be switched to full-screen mode in El Capitan! To exit full-screen mode, just press Esc. So how do you switch between applications if they’re all in full-screen mode? Move your pointer to the bottom of the screen to display the Dock, where you can click another application to switch to it. Invoke Mission Control and choose another application from there. Swipe three fingers to the left or right across the trackpad surface. From the keyboard, use the ⌘+Tab shortcut to cycle through the applications you have running.